Teak seems like naturally engineered for outdoors. In fact, it has been used for centuries in boats and ships and has been known to withstand moisture, sun exposure, and chemicals. Not only is teak furniture hard-wearing, it is beautiful as well; which is why it’s a prized possession in the outdoor furniture market. But while it can last practically maintenance-free, an investment like it needs a good cleaning and sealing services once in a while. A simple wash-and-wipe kind of teak furniture cleaning is enough for regular maintenance. But a more serious cleaning will be necessary overtime as the furniture can also experience cracking, roughness, graying, mildew, and discoloration. The usual cleaning is not enough for these conditions, with only professional cleaning as the best option. Accordingly, we only follow the proper procedure of cleaning teak. We begin by washing, wiping and then using the appropriate solution to get rid of stubborn stains. Scrubbing dirt buildup may be needed in some cases. In few cases, sanding off of the old seal is necessary. The point is that our teak furniture cleaning will get rid of all the dirt so we can start with a flawless surface. You have the option to leave it as is or it can be sealed and finished for that newer look. Now that the surface is clean, it’s a good idea to follow it with a teak furniture sealing. It aims to protect the wood from turning grey, silver, or black again. It also protects it from molds and mildew attacks. Restoration requires not only cleaning but also teak furniture sealing to top it off. But the hard part in restoring furniture is the work required to finish the job. Teak furniture, specially the vintage ones, demands a lot more. The surface has to be completely free of anything foreign—from mildew and other finishes. Of course, it has to be finished off with a good seal. The restoration process sounds easy, but in reality, it requires a lot of love and labor. 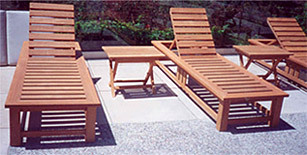 Newly cleaned, sealed, and restored teak furniture is enough to add interest to a boring outdoor living space. But at Teak Furniture Cleaning & Sealing, we understand that this furniture is not the only thing that makes up the entire outdoor. That’s why other related services are offered to complete your cleaning needs. 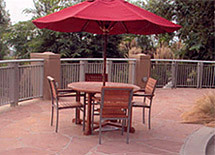 You can rely on us for furniture repair and wooden deck refinishing. Our team can also do umbrella frame repair or umbrella cover installation. How about cleaning of outdoor cushions? We do that as well. Our teak furniture cleaning and sealing services aim to enhance your outdoor living experience so you don’t have to worry about anything. Finally, it’s easy to enjoy a fine, lazy weekend afternoon while resting on newly cleaned, sealed, and restored teak furniture.